My Mom made us this yummy dish today, as we prepared our main floor for well, a new floor! It sure was delicious! I love it when someone else cooks for me…doesn’t happen often enough! I am not quite certain that I have the measurements exactly right, but I’ll just wing it here and I’m sure it will turn out great! This is an easy dish to use up leftover spaghetti noodles, and turn them into a nice looking meal to enjoy a couple days after spaghetti night. You could also use a cream sauce (mushroom soup or the like) and seafood to make a completely different dish. The possibilities are endless. Play around with it, add in different spices and cheeses and let me know what you come up with! Preheat oven to 350 degrees. 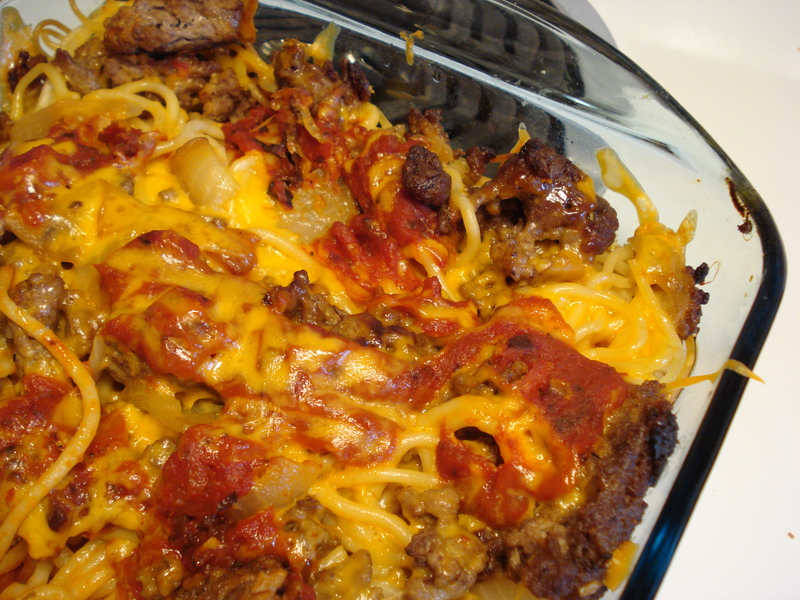 Layer all pre-cooked ingredients “lasagna-style” in a shallow baking dish. Cover with foil, and bake for 45 minutes until melted and bubbly. Serve with a side salad! hello!,I like your writing so much! share we keep up a correspondence more about your post on AOL? I need an expert in this house to unravel my problem. May be that is you! Looking ahead to look you.